Prince Charles has led tributes to the soldiers who paid the "unbearably high cost" of victory at one of the fiercest battles of World War One. The four-day Battle of Vimy Ridge in northern France in April 1917 saw the deaths of 3,598 Canadian servicemen under British command. Events marking the centenary have taken place on the site of the battlefield. 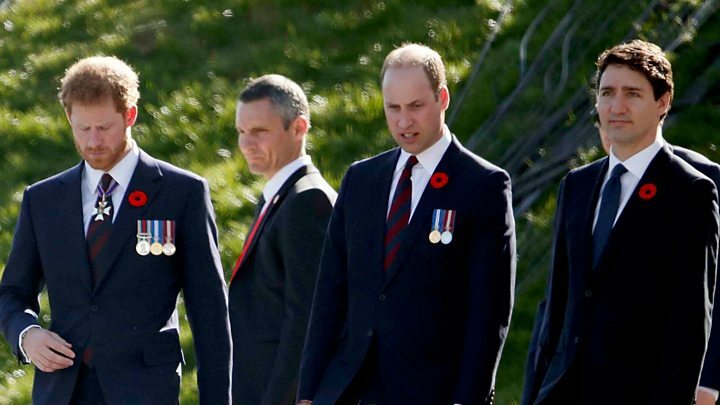 The Duke of Cambridge and Prince Harry joined their father for the service, and the Queen sent a message. She told the people of Canada it was important to "remember and honour those who served so valiantly and who gave so much". And she added: "On this day a century ago, thousands of Canadian soldiers stood far from home together with their allies in defence of peace and freedom." The events on Sunday began with a ceremony attended by Canadian Prime Minister Justin Trudeau and French President Francois Hollande. About 25,000 people, including relatives of those who fought in the battle, also attended the commemorations at the Canadian National Memorial on the battlefield near Arras. Image caption Prince Charles said the battle showed "Canada at its best"
Addressing them, Prince Charles said the Allied soldiers who died at Vimy Ridge "set an extraordinary example of selflessness for our future generations"
"This was, and remains, the single bloodiest day in Canadian military history," he said. "Yet Canadians displayed a strength of character and commitment to one another that is still evident today. "They did not waver. This was Canada at its best. The Canadians at Vimy embodied the true north, strong and free." Vimy Ridge was an engagement during the Battle Of Arras, which lasted from 9 April to 16 May 1917 and involved British, Canadian and Australian troops. About 159,000 allied troops were killed, wounded or missing in the Battle of Arras. Mr Trudeau also paid tribute to those who fought, saying: "The burden, they bore. And, the country they made. "Because this, too, is why we're here. Why we remember." He said the monument was "symbolic of Canada's birth and our enduring commitment to peace", adding: "One hundred years later, we must say this, together. And we must believe it: Never again." Scotland's First Minister Nicola Sturgeon is also in France for the commemorations in recognition of the 18,000 Scottish soldiers who died in the wider offensive. The fighting saw the highest concentration of Scots involved in any World War One campaign. Princes William and Harry laid a pair of boots at the site as part of a symbolic tribute to those killed. Along with their father, they also walked in the footsteps of the soldiers who took part in the battle by being given a guided tour of the preserved trenches. The ridge, which is about 108 miles (175 km) north of Paris, was captured by Germany early in the war and transformed into a strong defensive position. The attack on 9 April sparked four days of intense fighting, until Canadian forces under British command retook the heights overlooking the Douai Plain, which was still occupied by the enemy. UK Defence Secretary Sir Michael Fallon, who also attended the day's events, said the "power of Allied force" was as relevant today as in 1917 and was "continuing to make the world a safer and more secure place".